Stair treads can be built using plywood, lumber or other materials. When using construction standard lumber, the most common stair tread will be 2 x 12, 3 x 12 or 4 x 12. This material creates an 11 1/2 inch step, which provides a nice width for most feet. Highly trafficked stairs, for example stairs used in apartment complexes or commercial buildings will be made from steel or concrete while sometimes made from wood. 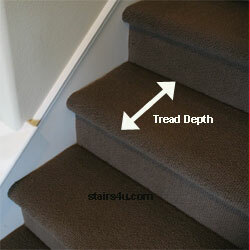 Concrete and steel stair treads will hold up better with less wear in high traffic areas. Steel is an excellent choice for stair treads and the complete stairway and will often be used in fire escapes. It's safe to assume that steel will not burn but it will melt, when it gets that hot I don't think anyone's going to be walking down the stairway anyway.